$400 Instant Savings. Expires May 23, 2019. * All prices reflect savings. 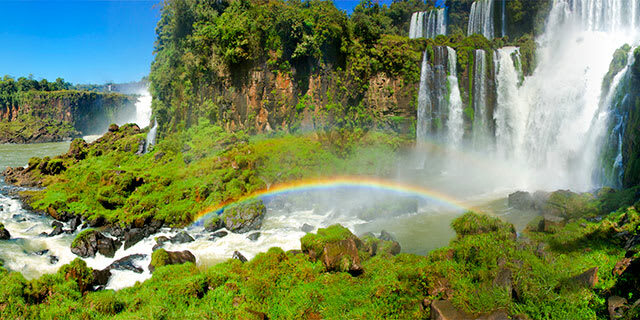 What to Expect This fast-paced, escorted tour involves a significant amount of walking or hiking, often on uneven terrain, and reaches high altitudes requiring a high level of physical fitness to fully enjoy the trip. This tour also includes long scenic drives between destinations and may have limited rest stops. Join us on a fascinating voyage of discovery as we visit some of the most splendid and awesome sites in the world. Peru, like the Parthenon in Greece or the Pyramids of Egypt, provides an unforgettable glimpse of the genius of a lost world. 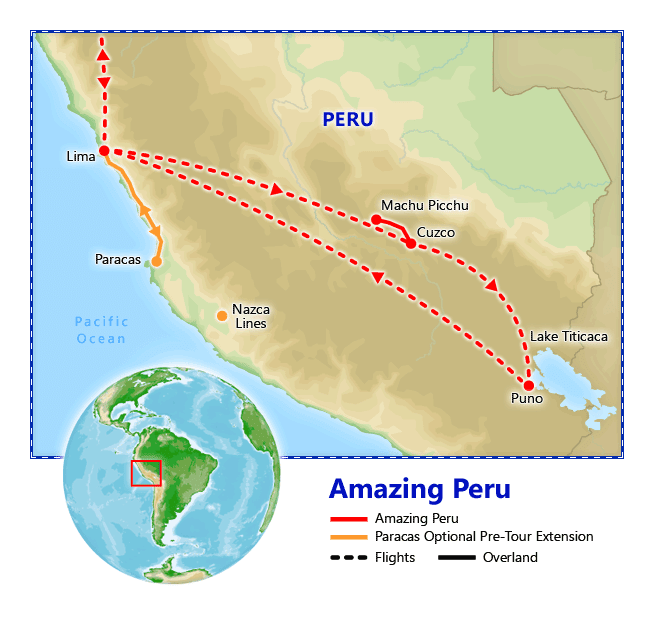 Highlights of this vacation package to Peru include visits to Lima, the City of Kings and the country's capital; Cusco, the 11,000 ft high Inca capital; Machu Picchu, the Lost City of the Incas and one of the most impressive archeological discoveries of all time; and Lake Titicaca, among the highest and most beautiful lakes in the world. Instant Savings: Get $400 off if you book by May 23, 2019! 1. Tickets for Huayna Picchu must be purchased immediately. Therefore, payment must be collected at the time of selecting this option and is non-refundable. After we process your reservation, we will send you a separate link to make this payment. This package offers round-trip flights from the cities listed above, subject to availability. Please review the flight schedule, especially if you're booking connecting flights. Accommodations: 2 nights The Westin Hotel, Lima. Full Day Itinerary: Today embark on a city tour of both modern and colonial Lima. See the Monastery of San Francisco, famous for its library and catacombs, and the historical city center, based around the beautiful and sprawling Plaza Mayor (Plaza de Armas). The grand Cathedral of Lima, the ornate Archbishop's Palace, and the Government Palace, also known as the Casa de Pizarro, line the plaza. Both the Government Palace and the cathedral were first built by Francisco Pizarro when he founded the city in 1535 to govern the conquered Incan empire (though both have been rebuilt since). Visit the fashionable districts of San Isidro and Miraflores with their beautiful parks and elegant residences facing the ocean. Tonight join your fellow travelers for dinner at a local restaurant. Accommodations: 2 nights Tambo del Inka Resort, Sacred Valley. Included meals: Breakfast. Full Day Itinerary: This morning, transfer to the airport to board a short flight to Cusco, capital of the Inca Empire and located 11,000 feet above sea level. Upon arrival, travel to nearby Pisac, a picturesque Andean village with a wonderful market. Here you'll have a chance to buy locally made ponchos, sweaters and other handcrafted clothing, ceramics and hand-painted beads. Enjoy browsing the "locals" section of the market, where villagers come from miles around, dressed in their traditional clothing, to barter and sell their produce. Continue to Ollantaytambo (9,160 feet above sea level), located at the foot of spectacular Inca ruins which protected the strategic entrance to the lower Urubamba Valley, also known as the Sacred Valley. The temple area is at the top of a series of steep terraces which helped provide excellent defenses. Stone used for these buildings was brought from a quarry high up on the opposite side of the Urubamba River, an incredible feat involving the efforts of thousands of workers. Afterwards, check in to your hotel for overnight. Full Day Itinerary: This morning visit the ancient village of Chinchero and its beautiful colonial church built upon the original foundations of Tupac Yupanqui Palace. Legend has it that Chinchero is the birthplace of the rainbow and perhaps that has something to do with the vibrant textiles that are produce here. You will have time to explore Chinchero’s artisan weaver’s complex, and discover the traditional techniques of weaving, dyeing and spinning. Return to your hotel mid-day and spend the rest of the afternoon at leisure enjoying the hotel’s amenities or alternatively, join an optional afternoon excursion to Maras or Moray. Optional Excursion: Maras or Moray, $20. Visit Maras or Moray this afternoon on an optional excursion. During the dry season (May through late-November) visit the salt works of Maras, consisting of about 3000 small pools, constructed on a mountain side. The ancient Inca would irrigate these pools with brackish spring water and allow them to evaporate to produce salt for the empire. During the rainy season (late-November through April), visit the archeological site of Moray consisting of enormous terraces in concentric rings which allowed ancient farmers to create diverse microclimates and harvest a variety of crops. 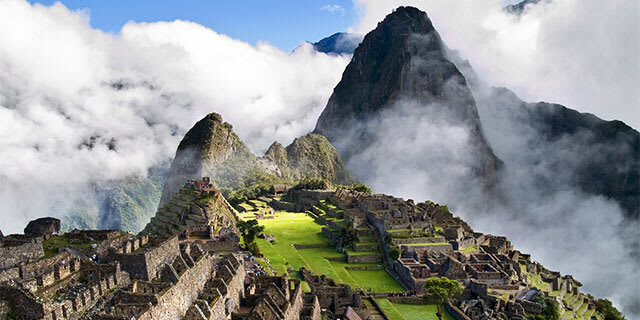 Accommodations: 1 night Inkaterra Machu Picchu Pueblo Hotel. Included meals: Breakfast & dinner. Full Day Itinerary:It's a short drive from your hotel to the Ollanta railroad station where you'll board the Vistadome train that will take you through the lush Urubamba Valley, passing through stunning scenery en route to Machu Picchu, one of the most spectacular and enigmatic archaeological sites in the world (8,000 feet above sea level). Unknown to the outside world until archeologist Hiram Bingham rediscovered it in 1911, Machu Picchu is now the most recognizable symbol of the Inca Empire. Believed to have served as a country retreat town for Inca nobility, the complex consists of giant walls, terraces, and ramps constructed from precisely cut rock formations. This impressive architectural feat, in combination with its breathtaking natural setting amid mist-covered green mountains above the rushing Urubamba River, makes for a visually stunning, and even mystical, experience. Later, return to your hotel in Machu Picchu Pueblo for dinner and overnight. Full Day Itinerary: After breakfast, the remainder of the morning is at leisure. This afternoon, enjoy a panoramic city tour of Cusco. You'll see the Plaza de Armas, center of the Inca Empire, where Francisco Pizarro proclaimed the conquest of Cusco. Here, you'll visit Cusco's beautiful 16th century cathedral. Then, just a few blocks away, you will discover the ruins of the Koricancha, an important temple built to honor Inti, the Incan sun god. When the conquistadors first arrived in Cusco, the temple was covered in sheets of solid-gold and adorned with golden statues, but within months of their arrival, the temple was stripped and the gold plundered as treasure for Spain. Next, continue to the Sacsayhuaman fortress, an emblematic Inca construction built in the 15th century. The size of the fortress and its massive stones are remarkable, and the manner in which they were transported, cut, and laid is still a mystery. Next, travel to Puka Pukara, also known as the "red fortress", which is thought to have been a military stronghold. It has many rooms, courtyards, bathrooms, aqueducts, and towers to explore. Full Day Itinerary:After breakfast, transfer to the airport for your short flight to Juliaca. Upon arrival, board your motor coach and drive to Puno located on the shores of Lake Titicaca (12,500 feet above sea level). Upon arrival in Puno, enjoy some free time to explore the city and grab a bite to eat. Later on, transfer to your deluxe lakeside resort for check-in. Included meals: Breakfast, lunch & dinner. Full Day Itinerary:This morning you'll visit beautiful Lake Titicaca, the largest lake in South America and, according to Andean legend, the birthplace of civilization. Legend holds that Mama Ocllo and Manco Capac, the founders of the Inca Empire, appeared from the deep waters of this lake. A highlight of your tour is a visit to the floating island of Uros, where many of the inhabitants still practice the old traditions of fishing, trapping birds, weaving, sailing and living in houses made of totora reeds which grow abundantly in the lake. Continue to Taquile, the largest island on the Peruvian side of the lake. Taquileños, the Island locals, are famous for their beautiful woven goods, widely regarded as some of the highest quality handicrafts in Peru. Here, you'll also be able to take in magnificent views of the lake, which looks like an ocean surrounded by mountains. Return to Puno this afternoon. Later this evening, enjoy a farewell dinner. Full Day Itinerary:After breakfast, spend the morning at leisure enjoying the hotel’s amenities and amazing views of Lake Titicaca. After check-out, embark on a city tour of Puno starting at the city’s colorful markets. Next, see its beautiful 18th century cathedral located on the main square and other important landmarks along Lima Street, Puno’s main pedestrian thoroughfare. The tour concludes at the Puma Uta viewpoint with a breathtaking panoramic view of Puno and Lake Titicaca. Finally, bid adiós to Peru as you transfer to the airport in the nearby city of Juliaca for your overnight return flight via Lima. From April 2019, flights departing Lima to Los Angeles (LAX) will depart just after noon today, arriving in LAX this evening. Passengers will stay at the Costa Del Sol Lima Airport hotel on day 10. Take advantage of your already-included international airfare by joining our pre-tour extension to Paracas, Peru. Passengers taking the Paracas Extension will depart the U.S. 2 days before the departure dates shown and join the main tour on Day 1 of the itinerary above. Full Day Itinerary:Your exciting journey to Peru begins as you depart Miami just after midnight on your flight bound for Lima, "City of the Kings”, Peru's diverse capital city. (You must check-in no later than 9pm of the night before your scheduled departure.) Arrive to Lima early this morning. After customs formalities, you will be met and escorted to Costa del Sol Hotel, located within the airport, for breakfast. 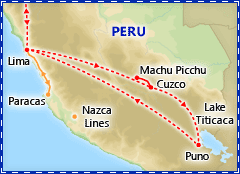 Afterwards, depart for Paracas, taking the Pan-American Highway south along the Pacific coast. Upon arrival, check in to your hotel. Full Day Itinerary: Enjoy the day at leisure to explore the town of Paracas or enjoy the amenities of your seaside resort. Alternatively, take advantage of an optional excursion and see the famous Nazca Lines. Full Day Itinerary:This morning transfer to Paracas Bay port to board your boat to the Ballestas Islands. As you sail, be on the lookout for the strange cactus-like engravings on the sand cliffs, believed to be created by the designers of the Nazca Lines. Sail along the coast of the Paracas National Reserve, the best shorebird sanctuary in South America. 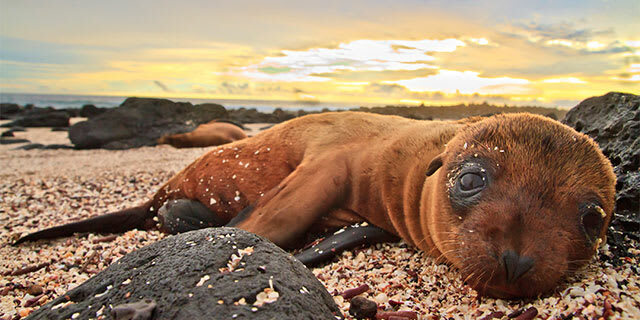 Numerous species of birds populate these islands, including cormorants, gannets, gulls, terns, pelicans, Humboldt penguins and other species, as well as a large colony of sea lions, (The Ballestas Islands boat excursion is subject to weather conditions.) This afternoon, return to Lima, in preparation for the next exciting leg of your journey. See Day 1 of the tour itinerary above for the continuation of your touring program. The high altitudes reached on this trip (Cusco is at 11,000 feet above sea level) and the amount of walking involved, often on uneven terrain, requires that you be in good physical condition to fully enjoy the trip. We strongly suggest that you consult your physician if you have any concerns regarding your ability to handle these conditions. In order to visit so many of Peru's must-see sights, this tour requires several long bus rides as well as early morning departure times in order to comply with flight and train schedules. Your patience and understanding are appreciated. Do I need a visa or any other documents? Please review the requirements about which documents you need before you travel.